The 63rd National film Awards were presented to Bollywood stars Amitabh Bachchan, Kangana Ranaut in the best actor and actress category on today evening. 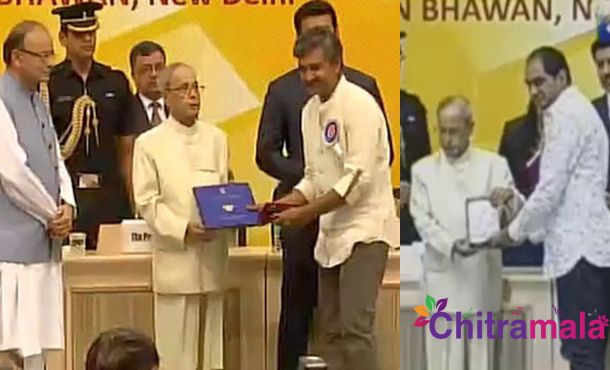 The awards were presented by President Pranab Mukherjee while finance Minister Arun Jaitley addressed the function. The winners of the 63rd National Film Awards are being honoured at a grand function in New Delhi on May 3. The winners of the National Film Awards list has already announced by the Directorate of Film Festivals on March 23. SS Rajamouli’s blockbuster movie Baahubali – The Beginning has won the Best Film award, while Krish’s Kanche bagged Best Regional film and Bollywood actors Amitabh Bachchan and Kangana Ranaut bagged the Best Actor awards for their performances in Piku and Tanu Weds Manu Returns respectively. The president Pranab Mukherjee awarded the winners with the medal and prize money. While Rajamouli was awarded 2.5 Lakh prize money, Krish and Kanche film producer Y. Rajeev Reddy have received one lakh prize money for their stunning hard work and creative work.